Ginsburg and Scalia’s Supreme Court complaints: Do they agree about what’s wrong with the Roberts court? Scalia and Ginsburg are really disappointed in the Supreme Court. But only one of them is right to be. Justice Ruth Bader Ginsburg, seen here posing for a group photo in 2009, longs for a less activist Supreme Court. Predictably, the left-wing blogosphere reacted with horror at Scalia’s implication that the courts had “invented” a homosexual minority. And equally predictably, the right-wing blogosphere exploded in umbrage at Ginsburg’s suggestion that the Roberts court is “activist” and that the Voting Rights Act case was wrongly decided. It’s not hard to spot some important parallels between the two free-range justices—the most famous legal frenemies of their time—and their controversial public statements about the Roberts court. Both Scalia and Ginsburg are among the most senior members of the court. Scalia is 77, and Ginsburg is 80. Each is doubtless beginning to feel that there is much they will not accomplish in their remaining time on the bench, and each appears ever more willing to achieve with dissents, speeches, and interviews what can’t be done in the four corners of a majority opinion. More importantly, both seem to be longing for some long-gone judicial era: Ginsburg evidently missing her own activist days as a women’s rights litigator, and Scalia missing the Ed Meese Revolution when everyone agreed that judges were utterly useless. But what’s most striking in their comments is how far the court has moved from both of them. Scalia and Ginsburg are arguably the intellectual leaders of the right and left wings of the current court. And each of them is persuaded that the court is absolutely headed in the wrong direction. It’s tempting to suggest, then, based on the recent comments of the two, that it’s a wash. If the court’s radical liberal bomb-thrower and equally radical conservative firebrand are equally frustrated, maybe the Roberts court is tacking precisely down the middle. That assessment would be precisely wrong. But it is worth a quick comparison of their complaints. At first blush, that sounds an awful lot like Ginsburg’s argument. Her principal complaint about the Roberts court is also that it overreaches. Her objection to the Voting Rights Act decision, both as outlined in her dissent and in the Times interview, is that it is “activism” for the court to reach out and strike down legislation that passed by large margins in the Congress. She is not, like Scalia, complaining about the psychological or moral weakness of individual jurists. She is upset by the institutional power grab of a court that overreaches without having a clue what it’s doing. Ginsburg has been increasingly vocal in recent years about her colleagues’ failure to understand how the real world works. Often when she talks about the Lilly Ledbetter case, or the two employment discrimination cases from this term, she invokes a perceived out-of-touchness in her colleagues, as she did dissenting in the Title VII cases where she accused her brethren in the majority of being “blind to the realities of the workplace.” (This was of course the dissent that drove Justice Samuel Alito to some epic eye-rolling on the bench, another highlight of the term Ginsburg discusses with Liptak in her interview). So while Scalia despairs of judges’ capacity to solve inchoate moral dilemmas, Ginsburg despairs of their capacity to understand how the real world operates. Scalia wants judges to stop trying to fix things. 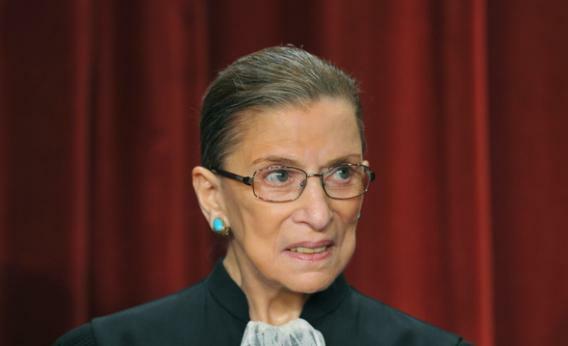 Ginsburg wants judges to stop stopping the rest of us from fixing things. In a way, they mirror each other perfectly. Over and above all that, Ginsburg worries that when the courts make a mess of things in the real world, Congress as it now exists lacks the institutional ability to fix it. Scalia is more complicated. He says he would defer to legislative bodies on most things (if gays want to pass a law, they should just do it!) but then rather consistently finds reasons to second-guess Congress whenever it actually does legislate. In other words, he is always apt to defer to the bill that didn’t happen, but ready to strike down a bill (like the Affordable Care Act, or the VRA) that did. Which brings us to how real their respective fears really are. In spring Nathaniel Frank suggested that Scalia’s arguments about moral opprobrium and approval in the law have been disproved by time, and also overtaken by history. Whereas Ginsburg’s prediction in the Voting Rights Act dissent–that the assumption that the law works and is thus no longer needed “is like throwing away your umbrella in a rainstorm because you are not getting wet”—has proven prescient, as Richard Hasen recently noted. The speed with which states like Texas and North Carolina sprinted to make voting more difficult in the weeks after the decision suggests that Ginsburg was correct in her assessment: The court badly misread the status quo. The true nature of their grievances is more subtle, and reflects all the interesting ways in which both Scalia and Ginsburg are of an era that is rapidly coming to an end: Scalia longs for a time in which the courts stayed out of it. Whereas Ginsburg longs for a time in which the court could properly redress social injustices—in matters of race and of gender—with a real-world understanding of how that plays out on the ground. To put it another way, despite the fact that only three years separate them chronologically, Scalia seems to want to reinstate the legal worldview of the 1980s and Ginsburg wants to reinstate that of the 1970s. With the exception of perhaps Clarence Thomas, they are the last two sitting justices who are so completely of another era—in each case an era whose legal hopes were never fully realized. No wonder they’re both feeling so frustrated. And no wonder they’re both so willing to say it so loudly.